Since we feed a raw diet to our dogs for many years now many have asked about it. We have found that the raw diet has been the best diet we ever have done. The dogs are healthier, stool is much harder and easy to clean up. They even drink less water. It has been a great experience. Feeding a raw diet, versus that of commercial dog food is a tough decision for some to make. Many factors may influence a persons’ decision on this matter. We have listed the many benefits of a diet full of raw (bone-in) meats, supplemented by organ meats. The benefits are endless! However, we have also learned through personal experience, that some puppies are prone to growing at a rapid rate and can suffer some adverse effects from the high protein that is contained within the raw diet. As many people know, large breed dogs grow at different rates. Many are consistent growers, but some are sporadic in their growth and this is where the problem begins. Proteins, Fats, Calcium, among other nutrients are important elements that contribute to a young dogs’ growth. The proper amounts of these nutrients can be vital to a healthy growth pattern for your young pup. If you are feeding raw, your dogs are getting somewhere in the neighborhood of 35-40% protein, inclusive of the organ meats, and any fish that may be fed for omegas. As mentioned before, some pups can handle this perfectly well and will thrive off of a raw diet. However, some will grow too fast from the high amount of protein. If you are feeding raw to young pups, beware of any signs of knuckling over, or any signs of the front/rear legs showing signs of bowing. If you notice any signs that your pup is growing too fast, it is best to immediately change the pups diet to a high quality lower protein kibble. You can reference our link to the “Great Dane Lady” for additional tips and help for knuckling over and bowing of the legs. 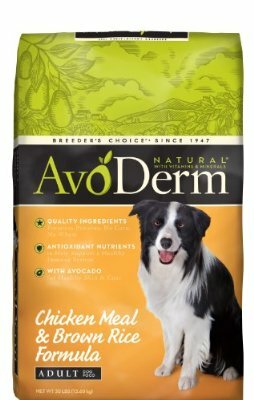 If you do not have access to any of the kibble that she recommends on her site, we have found that Avoderm Naturals Chicken Meal and Brown Rice Adult formula is a very comparable kibble to Precise Holistic. Good Luck with you new pup! Our suggestion on feeding pups and what we have found to be successful. We feed Puppies the Avoderm Naturals Chicken Meal and Brown Rice Adult formula up to the age 9-12 months. Once the puppy has reached a year old we then switch over to the raw diet. Since following these guidelines our puppies have not had any growing issues and transition over to the raw with no issues. If you decide not to do a raw diet once they turn a year old Avoderm is a great food to keep them on through their whole adult life.